A new exhibit at a Kansas City museum documents the destruction during World War I captured in a series of jarring and sometimes unidentifiable photographs and illustrations. See photos. KANSAS CITY, Mo. 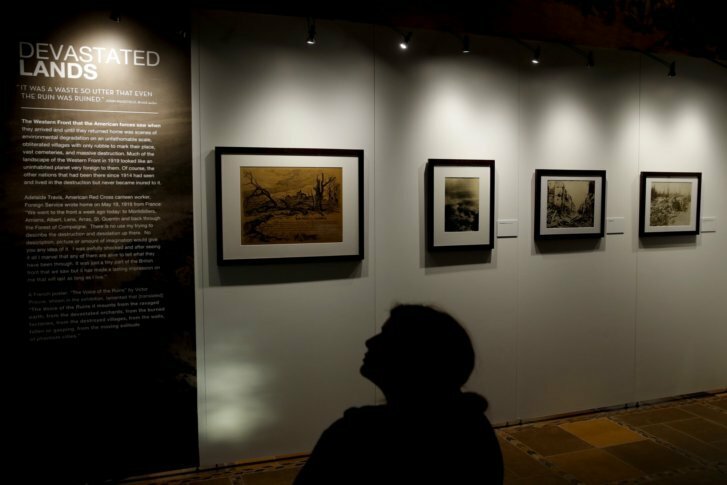 (AP) — A new exhibit at a Kansas City museum documents the destruction during World War I captured in a series of jarring and sometimes unidentifiable photographs and illustrations. The National World War I Museum and Memorial opened the exhibit called “Devastated Lands” last month, the Kansas City Star reported. The collection of photographs and illustrations shows battered landscapes along the Western Front that look akin to an uninhabited planet, according to the museum. One photo shows a bombed cathedral in Reims, France, where French kings were once crowned. An illustration depicts soldiers’ graves. Another photo shows a devastated street in Varennes, France. Tens of thousands of soldiers were maimed or killed in trench warfare on the Western Front during the war that began in 1914. European farmers continue to find still-lethal ammunition and objects from the war in their soil. It’s estimated that it could take an additional 100 years to find and remove all of the dangerous remnants of World War I and the following global conflict, according to the museum’s website. The exhibit will run through December.